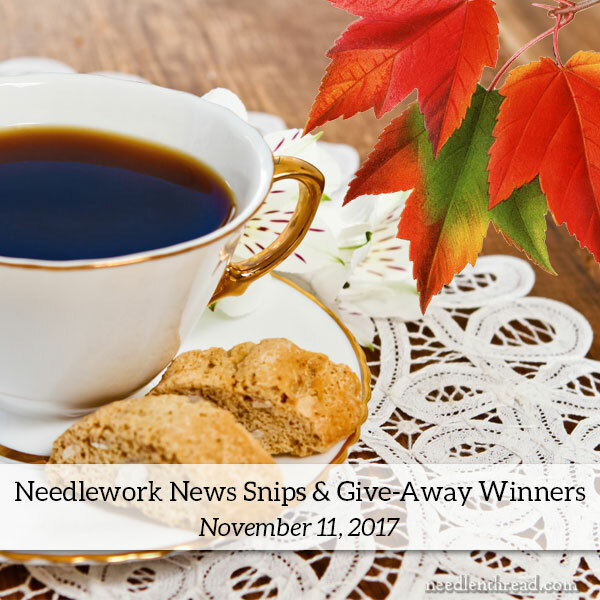 Needlework News Snips & Calendar Winners! The weekend is upon us! YAY! I’ve drawn the random winners for the Virtual Threads needlework calendars (with 13 free downloadable projects to work throughout the year), so I’ll announce those today. I’ve also put together a little list of inspiration, ideas, questions, needlework news and whatnot, for your weekend explorations. So… pour yourself a hot little beverage, pull up a chair, and let’s have a chat! We’ll take care of business first! Margaret Minneman, whose dream vacation includes needlework on the Outer Banks in fall and spring, and PEI in the summer. Susan, whose dream vacation list couldn’t be narrowed down, but it includes PEI and all the National Parks in the US – and needlework. Karen Rockenbach, whose dream vacation is just to stay at their home in Florida and stitch. Mary from AZ, who no longer does much traveling, but enjoyed her dream vacation a few years ago – Ireland, where she got to relax, stitch, sip tea and eat pastries. Congratulations all around! I will drop each of you an email today. I really enjoyed reading everyone’s answers to the give-away question about your dream vacation spot, and whether or not it would include needlework. I don’t think anyone mentioned a place that didn’t, somehow, resonate with me, too! Here are some wonderful public domain old needlework books available online. If you haven’t seen them yet, they’re worth taking a browse, and downloading for future reference or use! Brigg’s & Co Patent Transferring Papers – this is a catalog of old embroidery designs that, in the day, could be purchases as iron-on transfers. The designs are clear and crisp. Download the ebook and print a design that catches your eye! The Lady’s Guide to Needlework, Embroidery, Etc. – fun for a browse, and you can definitely extract some pattern ideas and technique info from it! Needlework Stuff doesn’t often go on sale – at least, outside of the big box stores. So when a sale comes along, it’s worth noting! Colour Complements is having a thread sale. She’s moving house, so she needs to downsize some inventory. There are discounts up to 30% on different things, so if overdyed threads are your thing, check them out! Nordic Needle has a bunch of stuff on sale right now. You may have heard the Very Disappointing news that they’re closing. I have no idea if they will continue Nordic Needle online – that hasn’t been announced yet – but the brick and mortar store in Fargo is closing, due to the cost of overhead. Besides checking out their sale category on their website, it’s worth signing up for their newsletter for the time being, too, because as they clear stock, they’re announcing special deals in their newsletter. Thistle Threads has this terrific little category on their website for small cuts of Soie d’Alger and Silk Mori. It’s a great way to acquire a few colors of silk to try, without spending a bundle for whole skeins. In fact, check out their whole Special Deals page – there are some delightful items on there! Silks, ribbons, trims, and this beautiful enamel acorn button that would make an excellent accent on autumn stitchery. Throughout history, soldiers and sailors have pursued stitching for various reasons and in various ways. Here are some articles that touch on the subject of military or naval men taking up needle and thread – they give interesting insight to a part of needlework that we might not often think about! Sweetheart Pincushions – embroidered by soldiers during WWI and sent back home to their girls. Stitching Lives Back Together – an article about embroidery used as rehabilitation in WWI. Soldiers Sewing on The Fabrica – a brief look at some history of soldiers and sailors, sewing. Hussifs figure into the article, and there are some great photos! Altar Cloth by Injured Soldiers – I’ve linked to this article before about an altar cloth stitched by injured WWI soldiers, on display at St. Paul’s in London. Disabled Soldiers’ Embroidery Industry – Began by Ernest Thesiger, an article about the founding, etc. of the industry. Finally! A way to incorporate needlework with sports. Great way to strive for fitness! As my friend Margaret put it, that’s some seriously low count ground fabric. And speaking of Margaret, over on Sharp Needler, Margaret Cobleigh is delving into stitching a piece of real Society Silk with real materials from the heyday of Society Silk. They’re violets. And they’re pretty! It’ll be a fascinating project to follow! Last year, I ran a series of give-aways leading up to Christmas, featuring some Very Delectable Stuff for embroiderers from designers or needlework businesses who wanted to get in on the series. It proved quite popular. I’m thinking about running something similar – perhaps not as intense – this year. If you were to participate in a special series of give-aways for needlework related stuff, what would especially entice you to participate? What would you like to have a chance of winning? Let me know! Feel free to chat me up in the comments below! And on that note, I needs must fly! I’m setting up a long project today. Not long in time, but long in length. You see, I have this strip of linen that I’ve been pondering. It’s long. It’s narrow. But it’s perfectly usable. So I’ve concocted something. I’ll share it with you soon! Mary – I have just bought a new chair that I will use for embroidering. It just came in a large box yesterday. My husband and I used our combined skills to put it together. Now I need a new light. Is there a lamp that will give me enough to see what I’m doing? So that’s what I would like on a giveaway! P.S. The chair I bought is made in Canada by a company called Dutailier. You can find them at baby stores because so many moms like them for nursing. This chair was on sale in a catalog at Costco, of all places. I am thrilled! Hi, Karen – I sat in a Dutailier chair once – and I thought “Hmmm…. I would like a chair like this for stitching!” But then I looked at the price tag. I put it on my “save up for this” list, but it hasn’t gone anywhere yet. I’d love to know which one you got and what you like about it. The one that I sat in was a recliner, but it had legs, so a stand could easily go under it when it wasn’t reclining, and the seat and back were very comfortable. It was also the “fully loaded” version, so I’m sure this had a lot to do with the price tag. They can be customized pretty nicely (the non-wooden-glider ones). No one around here sells them in a showroom situation, though, so it isn’t likely I’ll actually have one. And we don’t have a Costco. I’m always looking for “The Chair of Chairs…” but it hasn’t come about yet! Other than that, give-aways of floche and/or coton a broder would be fun. I’m not keen on the hand-dyed flosses – the colorways are rarely too my taste and it’s hard to use them well. But I’ve fallen in love with floche and coton a broder and would love to have more colors. Congratulation to all 5 winners of the give-away calendars, I hope you all enjoy your prize and thank you Mary for the give-away. A great selection of news snips, stitching soldiers and sailors is really interesting and I especially like the embroidered sweetheart pincushions they are beautiful. Great news about all the embroidery sales but such a shame that Nordic Needles is closing down. I don’t what would entice me to participate in a embroidery give-away I will have to think on that. I hope you have a great weekend stitching. Today is both Veterans Day in the USA and also Remembrance Day in Canada. As I write this message, it is now 10:50 am ET. I am watching a Toronto Ontario TV station, Channel 5, that is broadcasting a Remembrance Day show from Ottowa. It is a two hour program — with no commercials — showing the Canadian ceremonies. There is a giant parade that includes bands, bagpipe bands, lots of veterans from WWII to current times that are marching behind the different bands. The parade route is lined with hundreds and hundreds of folks — each wearing a poppy flower and cheering when the veterans pass by. The parade is ending at a cenotaph located in the center of Ottowa where wreaths of flowers will be laid by each branch of the Canadian Armed Forces — and from each war/conflict. There will be speeches in both English and French that honor the veterans. It is very moving. My hubby and I watch this Canadian ceremony every year on Nov 11. Interestingly enough, there are no ceremonies being broadcast on the regular USA networks in our area at this time. We are thankful that Canada has this TV experience that we can watch so we can do honor to veterans. A 3-D kit would be nice for a giveaway prize. Thanks for asking Mary! New tools, silk thread samplers, needle work paining kit are a few of the things that come to mind. And behalf of all your readers, can I say how very thankful we are that you are doing better. I would like to see giveways of unusual items that we don’t normally buy – new things to try that might be too expensive to buy larger size for ourselves. Threads,fabrics, books, your calendars were a wonderful idea for something a bit different. Maybe Nordic Needle would like to contribute this years books of Hardanger design winners, or The Essamplaire one of their designs for an historic sampler. New things to try. Maybe a different technique for each giveaway. Also, I loved the idea you had a couple of years ago for the 12 Days of Christmas giveaways, that was great. The lamp in the comment above is a good idea too, as is a magnifier, or lap frame…….. I would like to win threads! It’s an opportunity to try new ones… Thank you! Hi Mary, what a great news letter this morning – so much in it! I have downloaded a few of the embroidery templates from the Briggs & Co book so now would love some silk or linen fabric to embroider them onto, and/or, of course, some (silk) threads. I would consider that an amazing giveaway! I would love info on products you can use when arthritis in your hands begins to slow your time with the needle. I don’t want to give it up but my hands hurt now. Thank you. For giveaways I like everything and anything that you want to giveaway. If I had a particular favorite is new threads. They are usually the most expensive. mary, you are always thinking of your readers….i would loveLOVE to win a selection of linen in various counts and colors…or 100% wool,felted….these are two items that always seem to be out of reach for me, even when they are on sale…lol…. Would love to win some iron on transfer patterns. Many thanks Joyce. I live in rural Florida and there is no access to silk ribbon or lovely silk threads. I personally would to see a give away of these products. Wow, the embroidered tennis rackets are really something! And the bird on the fence . . . . I would love to win some nice fabrics for embroidering on (a nice linen perhaps?). Also, I love all the gorgeous embroidery scissors out there…those would make a great prize! And my favorite thing – threads! You can never have enough thread in my opinion! Last years giveaway series was the most exciting pre-christmas thing I’ve ever participated in! Maybe a chance to win one of Tanja Berlin’s kits this year? I would love a piece of good quality linen to try, or kits to work on. I’d like to do something in ecclesiastical embroidery, maybe a relatively simple pulpit frontal. I’ve done applique (the iron-on kind) for various liturgical seasons , 15″ wide. It has been a labor of love and the congregation seems to enjoy what I have assembled. I’ve been thinking that branching out to a new medium where a sewing machine was not involved would be a good thing for my own benefit as well. I would love to win some skeins of silk threads! It seems I can’t get enough of them! For the series give away I would like anything related to needlework especially thread of any kind, needles, piece of fabric, stuff from the crewel co.,etc. I would love a chance for lovely small Dovo scissors for embroidery. They are just so wonderful to use. I’ve recently joined your mailing list and have tipped my toe again into embroidery. It’s been way too many years and I’m thoroughly enjoying re-learning! I’ve never done more than the simple embroidery stitches and am looking forward to new projects to expand my skills. As for giveaways, I would love the opportunity to win a variety of fabrics, threads and unique items that I wouldn’t normally use my meager crafting budget to purchase. Thank you for the generous advice and information you provide through your blog and newsletters. I would love to have an embroidery calendar. Getting older (I’m 85) has made it almost impossible to hold my hoop as I sit to stitch. I could really use a hoop on a floor stand. Being on a budget makes it difficult to put on the necessary list. My philosophy is you can’t have too much thread so I’d love to win any kind of thread. When starting a new project it’s always fun to find most of what you need in your stash. Hi Mary. Wonderful threads top my list of yearnings. I would love to sample gilt sylke twist. I have recently begun a small stash of floche and would like to extend that collection. And then silks…always silks. But in truth your site is a prize every day! I have learned so much from you and am grateful every day. If I could win something related to needlework it would be a floor frame. It would improve my pieces to be able to work with both hands free. I could also use it in my demonstrations on needlework in living history. Great idea Mary. I have learned a great deal from your newsletters. I’m really just a beginning stitcher. I learned a couple of basic stitches from my mom when I was 9 or 10 ( some 50+ years ago) but since then I have done very little stitching until now. I’m keen to learn good solid foundation building information so I’d be interested in receiving your ebooks or or some of the A to Z books. I’d love different types of thread to try, kits, or some of the books that you’ve reviewed in a giveaway! Hi Mary from Down-under. I love your newsletters. They come so often and are always full of interest. So thank you for your energy and enthusiasm which bounce out of every letter. I am not good at concocting so I am really looking forward to your concoction for your long piece of linen. I have quite a stash of linen that I must start using so I hope to be inspired! Keep up the excitement. I would love a special pair of scissors that I could dedicate just to embroidery and other hand stitching. I grew up with a mother and two grandmothers who all sewed and I knew better than to cut anything other than fabric or thread with their scissors! I have 3 pair of Gingers, two small pair and one large dressmakers pair but they are all at least 30 years old. Still in great condition but it’s so much fun to have new and beautiful scissors! Fabrics and threads are always the best to get. Linens and silks…the newest and best.! Thank you for including the articles on the service men sewing projects. I try to see my dad doing something like that and I am afraid his little fat fingers would not work with the tiny stiches! Made me smile! That’s a hard one to narrow down! I think most likely specialty threads, fabrics and instruction books. Oh, a GOOD light! Oh Mary what a fun post. I’d love to do one of the patterns from Inspirations Magazine. So glad they’ve put them up as downloads. A gift certificate to Mythic Crafts would be a dream come true, a kit from the French Needle, a printed linen from the Crewel work company, I’d also like to experiment with some of the new things like cork, lutradur….and of course a box of gazlillion threads from Valdani Silk! What a treat it would be to receive a box of silk threads for surface embroidery and then, perhaps, a box of wool for crewel work. And finally, a truly special treat would be a stamped linen design to use the silk or wool threads. Just dreaming…..
Christmas and long strips of linen reminded me of the Hungarian redwork runner. Did you ever get a picture of that on a decked-out table? Do you use it at Christmas? How has it held up? As to the rest of the post, I really enjoyed the Soldiers/Sailors bits. So very interesting. Thank you. Thank you for the sites listed in your article of Nov 11th re Stitching, Soldiers and Sailors. It was a most enjoyable read. You have a treasure trove of information re stitchery which you are most generous in sharing with us. Again thank you. As to what I would like to see in your ‘give-aways’ – they are exotic threads, materials on which to thread and of course accessories. Full kits are best of all. I have found that a lot of projects that I would like to do, the materials are not readily available. Sending away for them can be very costly. A perk now and again are most welcoming. Today has got me thinking; Saturday was Armistice Day; next year it will be the 100th anniversary of the day the First World War ended. I was wondering if individual stitchers/groups/societies who do whatever form of embroidery/weaving/stitching/patchwork etc. were planning any work to mark this anniversary next year, and whether perhaps you were thinking of setting a challenge to mark the occasion? It would be wonderful if everyone could work together to create displays in their local communities etc. Dear Santa, I have a weakness for nice, pretty scissors. Maybe you could also include some pretty threads I drool over, but never buy for myself. And some of the nice fabrics I hear about. Some on-line classes would be so exciting. Oh, the list could go on and on but don’t want to sound greedy. As you know, I’ve been extra good this year. Personally, I think that all you have to do is announce the giveaway to make it enticing!!! Participation is fun in itself, creative stitchers get excited over any unexpected addition to their stash! And to those who will be able to attend. Still be too cold for me. Really enjoyed the historical glimpses of the military and sewing. I feel all those who served in all military services were more than they seemed. I would like to see small kits, such as Tanja Berlin or Trish Burr or Anne Scott to name a few embroiderers. Perhaps a book, such as an instruction book or a colouring book by Johanne Basford! A few ideas and I always such fun to participate whatever the giveaway. Your “giveaways” are always fun and it’s clear people would like: embroidery stands (if only…), linen samples and thread and more thread. In keeping with the thread theme – how about a box of a wide range of different types of cotton threads? I have only embroidered with six-strand floss but your essays about all the other types make them sound so tempting. High quality embroidery scissors and those cute, magnetic “needle minders” would be holiday treats. Your essays cover such a world of topics — you do a great job! Thank you so much. I would love to win your Lavender Honey designs or other small patterns for linen. Linen fabric is always wonderful to see, maybe larger count though like 28. Also the newest DMC colors of floss. Love your site. Thank you. A little bit after the fact I know, but I did so enjoy this post to your Blog. All of the information (as it always is) is so interesting on many different levels, I especially enjoy having the two e-books now in my library and the articles on the soldiers recuperative stitchery. I love looking at patterns and dreaming up my own thoughts on colors and stitches. It starts out as … Oh, this is nice (interesting) and goes on to … What colors would set the right mood, then I get to … Hmm, I wonder what stitches could be used, and lastly … Alright, this is great, how could I use (or gift) this. Sometimes I even make notes on them. My family has always said “Ah Brenda, you always are a daydreamer!” Can this be counted as a hobby? The sales information and product websites are always a great sewists dream list and my list is getting ever bigger so I keep the wanna have list and prioritize the gotta have list for future purchases. These posts, I’m sure, take time to create but are so appreciated by your readers. Thank you. Different kind of linen and various kinds of flosses and threads would be my favorite type of giveaway items.